The DNS Recovery Kit provides a mechanism to create, update, and manage a DNS A record and associated PTR record for a virtual server name. The DNS resource allows the administrator to configure the managed virtual server name and also the IP address it will be associated with when placed In-Service on each specific LifeKeeper cluster node. The example charts below show the changes that occur in DNS for a managed server name (SQLSERVER) when In-Service on primary and backup cluster nodes. In this example, the Primary node’s public IP address is 172.17.10.24, and the Backup node’s public IP address is 172.16.10.25. The managed virtual server name SQLSERVER will have its IP address changed based on which LifeKeeper node it is in service on. Clients use the FQDN “SQLSERVER.mydomain.com” to connect to the application that is associated with this virtual server name. DNS resource configuration requires that all cluster nodes are members of a single domain and that domain includes at least one DNS server that is accessible to each LifeKeeper cluster node. During DNS resource creation and extension, one or more targeted DNS server names to be used by each cluster node are requested by the SIOS Protection Suite Resource Configuration Wizard as shown below. The Create Protected Application window appears displaying the Primary and Backup Servers in your cluster. Select the correct systems for this configuration. A dialog appears with a list of all recognized recovery kits installed within the cluster. Select DNS and click Next. The Create Protected Application will prompt you to enter the information in the table below. After receiving the message that the resource hierarchy has been created successfully on the primary node, click Next to continue and extend the DNS resource to the backup node. Select or enter a unique tag for the DNS resource instance you are creating. This field provides a default tag name which you can change if desired. A Record Owner Name Enter the name of the virtual server whose A and PTR records will be updated in DNS. This server name entry is a NetBIOS computer name, NOT a fully qualified server name. IP Address Enter the IP address to assign to the virtual server name when the DNS resource is in service on this node. This is usually the LifeKeeper node’s public IP address. The A record mapping of this IP address to the virtual server name will be updated upon failover or switchover to this local node. Enter the fully qualified name of one or more targeted DNS servers in the form of <DNS Server Name>.<mydomain>.com, where the DNS Resource Records can be modified. If multiple DNS servers are being configured, their names must be space-separated. At least one DNS server must be accessible at all times from the primary or backup LifeKeeper servers when they are In-Service, preferably co-located at the site of each LifeKeeper node. The targeted DNS server lists may be the same or different on each LifeKeeper node. Upon failover or switchover, records on the NS (Name Servers) in the DNS environment will also be updated. You do not need to provide a complete list of all of your DNS servers during creation of the DNS resource. LifeKeeper only needs to connect to one of the servers in the list in order to complete its DNS operations – it will discover the other DNS servers in your configuration when it successfully connects to any DNS server in the list. DNS Administrative User Name Enter the user name of the Windows DNS/Domain administrator. This user account should have privileges to make changes in the DNS configuration and should be a member of the “Domain Admins” group in the same domain as the DNS server. Enter the user ID in <DomainName>\<UserID> format where <DomainName> is the NetBIOS name of the domain. DNS Administrator Password Enter the password associated with the Windows DNS/Domain administrator account. 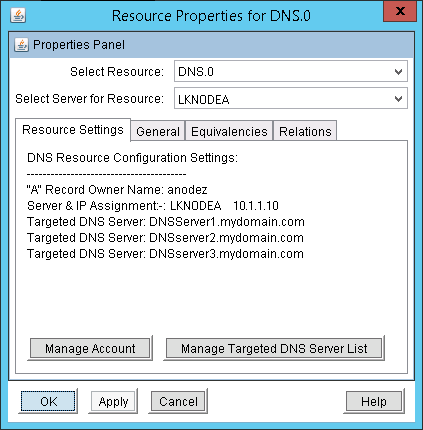 To modify a DNS resource configuration on each server, right click on the DNS resource and select “Properties”. A summary of the current DNS Resource configuration will be displayed as shown below. Configuration of the DNS resource on each cluster node can be quickly inspected and/or modified by selecting the specific LifeKeeper cluster node in the “Select Server for Resource” drop-down box as shown above. The DNS deep check script, which monitors the managed DNS resource, will check for the existence of the A record of the managed server name on the targeted DNS server (first successful connection) and then on discovered (NS) DNS servers. If the A record mapping to the correct IP address is not found on at least one of the DNS servers, the deep check script will fail, which will trigger local recovery (if enabled) and the A and PTR records will be recreated on the targeted and discovered (NS) DNS servers. If local recovery is not enabled on the DNS resource, or if enabled and not successful, then a failover will occur.